Hair transplant has become widely accepted and successful procedure for even extreme level of baldness. Surgical hair transplant procedure is done with procedures like FUE, Advanced FUE and Bio FUT and FUE procedures so that patient can get outstanding results for lifetime. Our advanced FUE procedure is the innovative procedure designed to enhance the speed and efficiency of surgical team by increasing graft viability while reducing the pain, scars and even cost of procedure. This procedure has been done with innovative device designed to speed up the harvesting process and even this device also counts and separates the grafts by the number of follicles so that these can be preserved in a sterile controlled environment till their implantation. 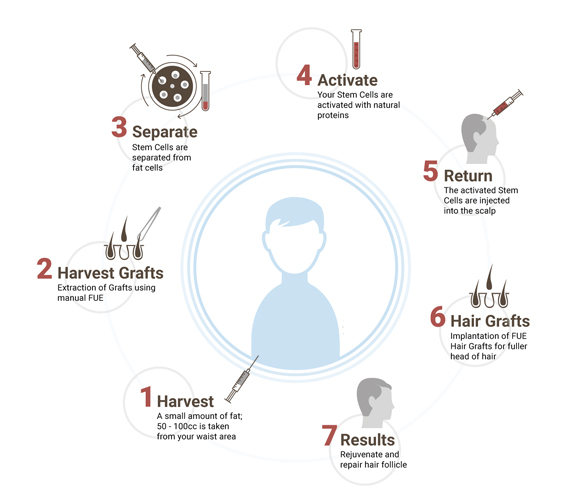 The basic procedure for the Advanced FUE is same as the other hair transplantation procedures means the shifting of loss resistant hair follicles from the donor part to the bald portions. However in this advanced version of follicular unit extraction procedure, surgical team use the advanced device and technique to extract individual micro hair graft from the permanent zone of head. The grafts are collected, counted and preserved in the sterile controlled environment before their implantation into bald portions to ensure their natural and thick growth. HOW ADVANCED FUE DIFFERS FROM OTHERS? There are various other hair transplant procedures in India available to treat baldness but all that methods are fundamentally slow. However the advanced FUE procedure ensures the better visualization for the surgeon for extraction, sorting and counting the grafts to reduce the time consumption during the physical manipulation. This advanced and innovative procedure done with advanced and revolutionary new technology can reduce the extraction time by 1/3rd of the existing technologies. This procedure is faster and better than the other older methods of hair restoration. For this procedure there is no need to shave the entire head even if you have long hair. in this method surgeon can harvest the donor follicles by shaving the small area of your head that can be covered easily by your existing hair. This method is suitable for both men and women as this method can be done without shaving heads which is bigger concern for women.